Rear Admiral Grace M Hopper was a remarkable woman; an American computer scientist who programmed the very first computers, and United States Navy rear admiral. Born in 1906 she graduated from Vaser College with a BA in mathematics and physics and, while teaching at Vasser, went on to study mathematics at Yale University, where she earned an MA and a PhD a rare accomplishment then, even more so than today. She remained at Vassar as an associate professor until 1943, when she joined the United States Naval Reserve and was assigned to the Bureau of Ordnance Computation Project at Harvard University. While at Harvard Cruft Laboratories she encountered the Mark I computer, becoming just the third person to program the Mark I. She received the Naval Ordnance Development Award for her pioneering applications programming success on the Mark I, Mark II, and Mark III computers. Her vision was to introduce computers to a wider audience than just the military by making them more programmer and application-friendly and to this end she joined the Eckert-Mauchly Computer Corporation to provide businesses with computers. Here she started to work on UNIVAC I, the first large-scale electronic digital computer. Through her commitment to sharing and to collaboration she encouraged programmers to collect and share common portions of programs. Even though these early shared libraries of code had to be copied by hand, they reduced errors, tedium, and duplication of effort. In her quest to make programming more accessible to programmers, Grace persisted with her belief that programs could, and should, be written in English. Her team created the first compiler for computer languages (a compiler renders worded instructions into code that can be read by computers), later known as FLOW-MATIC, which was designed to translate a language that could be used for typical business tasks like automatic billing and payroll calculation. Having made a computer “understand” twenty statements in English she was sure that an entire programming language could be developed using English words. Her ideas met with sceptisism and it was three years before her idea was finally accepted and she published her first compiler paper in 1952. Without FLOW-MATIC COBOL (an acronym for COmmon Business-Oriented Language) probably would never have been invented and Admiral Hopper lead her team to develop useful COBOL manuals and tools. Another major contribution to computing was in standardisation and validation. Under her direction, the Navy developed a set of programs and procedures for validating COBOL compilers, which eventually led to international standards and validation facilities for most programming languages. She retired from the Naval Reserve in 1966 but was recalled to active duty at the age of 60, to help in standardizing communication between different computer languages. She was 79 and a rear admiral by the time she finally retired from the navy and was the oldest serving officer in the service. She was awarded the first ever Computer Science “Man-of-the-Year” Award from the Data Processing Management Association and was the first person from the United States, and the first woman of any nationality, to be made a Distinguished Fellow of the British Computer Society. She was a much sought-after speaker and did much to aid the understanding of computers to the general public and her use of analogy is legendary. Here she explains the concept of a nanosecond. As a celebration of her contribution to women in STEM, the Grace Hopper Celebration of Women in Computing conference, designed to bring the research and career interests of women in computing to the forefront, is now an annual event in the USA. 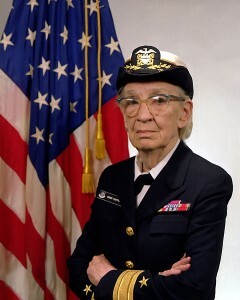 Grace Hopper died, aged 85, and was buried, with full military honours, in Arlington National Cemetery.